How is ioby different than other civic crowdfunding sites? In the last ten years, crowdfunding has become a huge industry, with billions of dollars a year being exchanged on hundreds of platforms worldwide each year. Crowdfunding has supported everything from art and music, to new technology, to personal causes like medical bills and travel expenses. The sub-field of civic crowdfunding – in which money is raised for projects for the public good – has also grown, although at a much smaller scale. ioby is part of this civic crowdfunding movement: more than $2.5 million has been raised on our platform by residents who want to make their neighborhoods safer, greener, and more livable. With an average project size of less than $4,000, that’s a lot of small change making a big impact. As our more than 700 ioby leaders have learned, raising funds to make positive change in your neighborhood can be a game-changer. However, our online crowdfunding platform is only a small part of what we do. As a community-driven nonprofit with a deep commitment to social equity, our goal is to provide all sorts of new tools and resources to neighbors with great ideas to improve their own neighborhoods. (More about how we choose where to work is here.) This might mean finding volunteers, or being connected with a decision maker in city government, or with a network of peers whose experience and stories might benefit a first-time leader. In short, we want to connect change makers with the knowledge, resources, and networks they need to succeed. And we recognize that in order to do so, we need to focus beyond just our online presence to build real, on-the-ground communities. Our services include a full suite of in-person and online trainings. As soon as you submit a project idea to ioby, we’ll reach out to help you refine it to give you the best chance of success, set a budget, make a fundraising plan, and set realistic targets and a timeline. We’ll continue to work one-on-one with you during your campaign to help you strategize on the fly, and send you tips and resources tailored to your campaign. Unlike some other civic crowdfunding sites that primarily raise money for government-led projects, we focus on serving citizen-led groups from loose networks of neighbors to established nonprofits. ioby leaders might be totally new to fundraising, or might be part of an organization that typically relies on grants and is looking to try another tool. And while the average ioby project is fairly small in scale, we believe the benefits to the neighborhood, to the leader, and to the community go well beyond dollars raised. 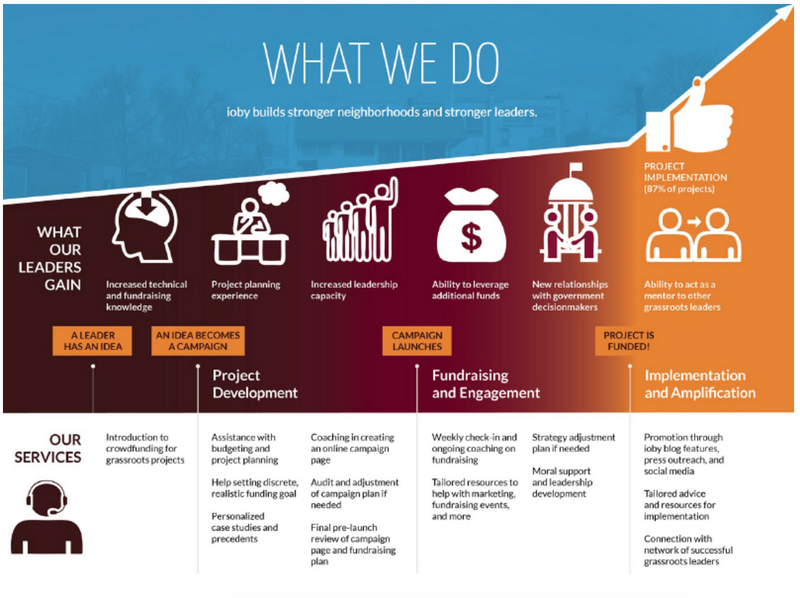 Carrying out a small-scale, community-driven, and quickly-implemented project in your neighborhood can be a powerful way to engage the place you live, your neighbors, and your local leaders. And taken together, all this citizen-led, citizen-funded change is making a huge impact in the way our neighborhoods are shaped.